With all the criticism due to being an agent of consumerism, there is also a lot to be said positively about the home giant Ikea. The latest in a line of products that the company makes being aware of the future, is actually not green, but a green house. If you don’t have room in your yard for your own greenhouse then the Swedish retailer has a solution. Their new SOCKER mini greenhouse is the perfect place to raise your favorite plants, indoors or outdoors. The planter looks just like a life-size greenhouse, and it easily opens via a hatch set into the peaked roof. The roof hatch is set onto a triangular frame, which lets in ample fresh air to give the plants inside plenty of breathing room and circulation. Should the interior get too hot, the adjustable roof vents can be left open to lower the interior temperature. Plants can also be easily watered using the moveable hatches. The greenhouse can be used for standard houseplants or for raising seedlings, as it provides an insulated environment for the plants inside to thrive. The rest is up to you. Fill the mini greenhouse with potted greens for a window sill, or with flowering buds for a living center piece. 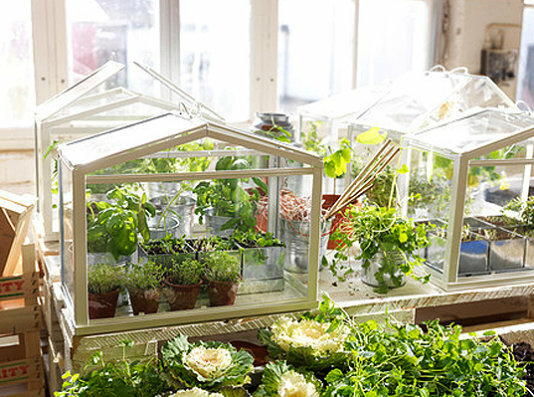 Or put the greenhouse in the kitchen and create an edible garden of fresh herbs for cooking. Terrariums are a great way to grow plants indoors, and they’re perfect for city dwellers with smaller houses or apartments. If a yard or outside gardening plot is out of the question, that doesn’t mean growing your own plants is impossible – at 12.99 euro, this IKEA mini greenhouse can give any home a garden. Its mini size (Width: 45 cm Depth: 22 cm Height: 35 cm) allows to combine a few of them at home, or even on the window ledge.